Use the Font Picker to change the style and size of your text. 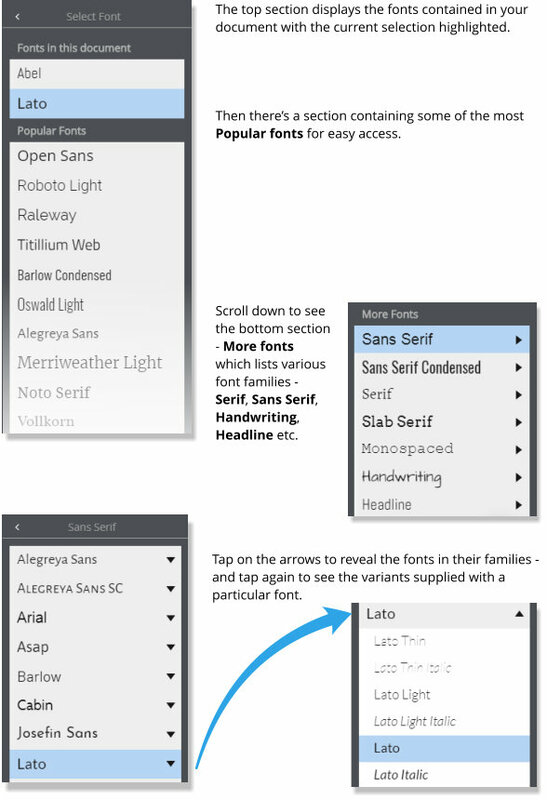 Use the font picker to choose your own fonts - we’ve started with some essential baseline features but we will be adding to these in later releases. If you look at the Text Properties menu you’ll see the Font section which shows the currently selected font (or the one in which the text cursor is placed) as well as the size of the font - use the slider to adjust or enter a value. The value you enter will be converted to either Points (pt) or Pixels (px) depending on the type of document. So a web document like a website or a Facebook post will display pixels and a print document like a flyer or a letter will display points. Where a font has a bold variant then you should consider the bold character function in the Text editor as a kind of extra bold - thats to say it's application will add boldness to an already bold variant.